We were heading through the earthquake zone to the south of Colchester, visiting a succession of small, pretty and mostly rebuilt churches. 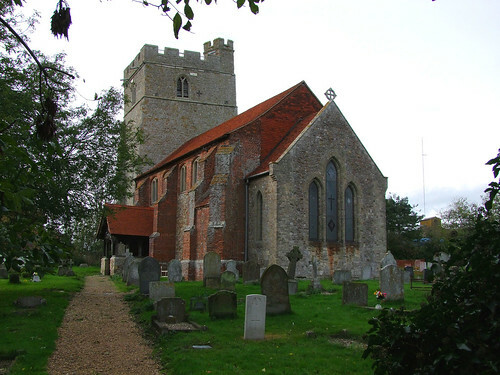 Unusually, Peldon's church sits in the heart of its village. Open. A most curious mix - the chancel collapsed in the earthquake and the nave was damaged, but the ragstone tower withstood the shock. The nave has been repaired in redbrick, a part of the former ragstone south wall remaining as a patch. A truncated chancel has been added in a rather alarming yellow brick and flint rubble mix. However, when you step inside the star of the show is a super 15th century hammerbeam roof, making this a bright hall of a church with no stained glass and crisp white walls. I liked it a lot. You wondered why they didn't just block the east end, as the effect would have been even more dramatic. This is obviously a church which is intended to look nice, and it was a pleasure to be in here on such a sunny day. On the north wall is a large mosaic by local people of the Peldon madonna.